Dr. Kratt is a 1998 graduate of the University of Wisconsin School of Veterinary Medicine. His emphasis in veterinary school was small animal surgery, medicine and nutrition. He is active in the community and served as President of the Wisconsin Veterinarian Medical Association. His interests include surgery, oncology, and nutrition. Dr. Kratt is a native of the La Crosse area. He attended Aquinas High School and the University of Wisconsin-La Crosse. Doug and his wife Kim own one Vizsla (Soca), German Shorthair Pointer (Welpen), English Cocker Spaniel (Mollie) and one Persian (Hippolyte). Dr. Kratt is a 2000 graduate of the University of Wisconsin School of Veterinary Medicine. Her emphasis in veterinary school was parasitology, clinical pathology, small animal surgery and medicine. She was very active in the organization of “Pet Pals” pet therapy program in Madison. She received numerous awards in school for her community activity and academics. Her interests include dentistry, ophthalmology, and ultrasonography. Dr. Kratt is a native of the La Crosse area. She attended Logan High School and the University of Wisconsin-La Crosse. Kim and her husband Doug own one Vizsla (Soca), German Shorthair Pointer (Welpen), English Cocker Spaniel (Mollie) and one Persian (Hippolyte). Dr. Moore is a 2016 graduate of University of Wisconsin School of Veterinary Medicine. Her emphasis in school was small animal surgery, emergency medicine, and primary care. Dr. Moore grew up in Illinois and attended undergrad at Winona State University, where she fell in love with the area. 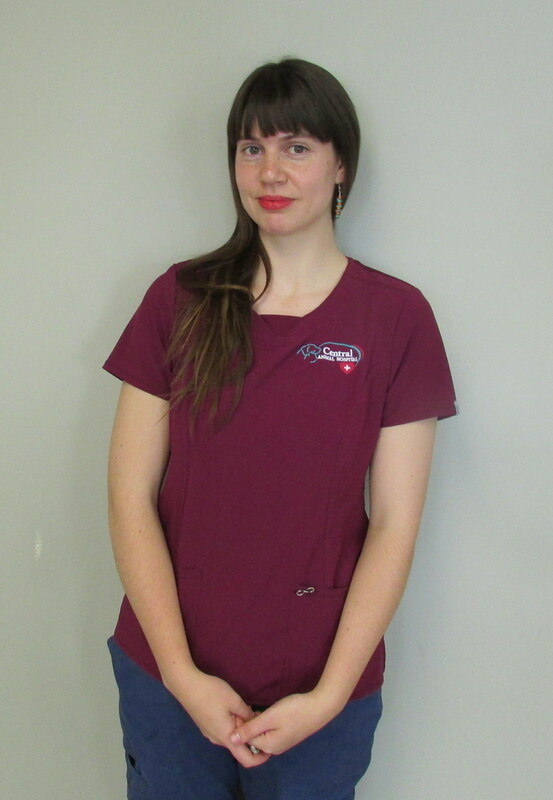 Her interests include surgery, emergency medicine, and ultrasonography. Dr. Moore enjoys hiking, horseback riding, running, and spending time with her friends and family in her free time. She lives at home with her husband, her dogs Ragnar, an Australian Blue Heeler mix, Ares-a Shepherd mix, and her cat Cali, a domestic short hair. My favorite breed is the Airedale Terrier. I like almost all terrier breads but i am partial to the black and tan breeds. I enjoy watching dog shows and working in my flower garden. Being home with my kids, listening to podcasts, and drinking coffee. Reading, hiking, painting, and crafting. Being outdoors and spending time with family and friends. Kayaking, hiking, fishing, and snowboarding. Hanging out with my cats, spending time with family and friends, traveling, hiking, shopping, being out in nature, and watching TV/movies.